Have you got Google Earth on your computer? If so, then download the Google Earth view of South Belfast N I Football Supporters Club. Is this the wrong position for South Belfast N I Football Supporters Club? If you think so, then modify its position. 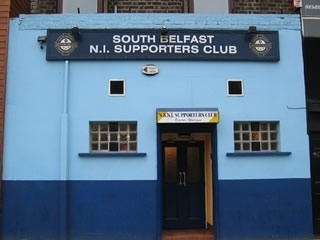 Click / Tap the button above to get directions from where you are to South Belfast N I Football Supporters Club. Great people great time on the Sunday dinner time. Made v welcome by staff and regulars sending over a nice picture for the wall of the one and only best. All the best from stoke on trent rsc. To you all .especially one for the road brian the jeweller..
was in here Saturday and sunday 30th nov and 1st dec . great wee club, friendly staff and customers and cheapest drink around. will be back soon. Come over to Belfast a couple of times a year love the place love the people Not been in this bar but will no worries btw great result tonight Northern Ireland 1 Russia 0.
we had passed this club loads of times and never bothered going inside.we decided to pop in have a sharp one and use the toilet. THAT WAS THE BEST MOVE WE MADE!!! we loved it, we were made more than welcome.we will be going to belfast again shortly and can't wait to pop in for one or two. A GREAT CLUB WELL WORTH A VISIT AND A CREDIT TO ALL OF IT@S MEMBERS. A great wee place, the staff and members made you feel like one of their own. Will definately make it a stop on our next trip to Belfast. Great little bar with a great atmosphere. Staff are quite friendly and the customers are very welcoming to strangers, especailly fat Americans.